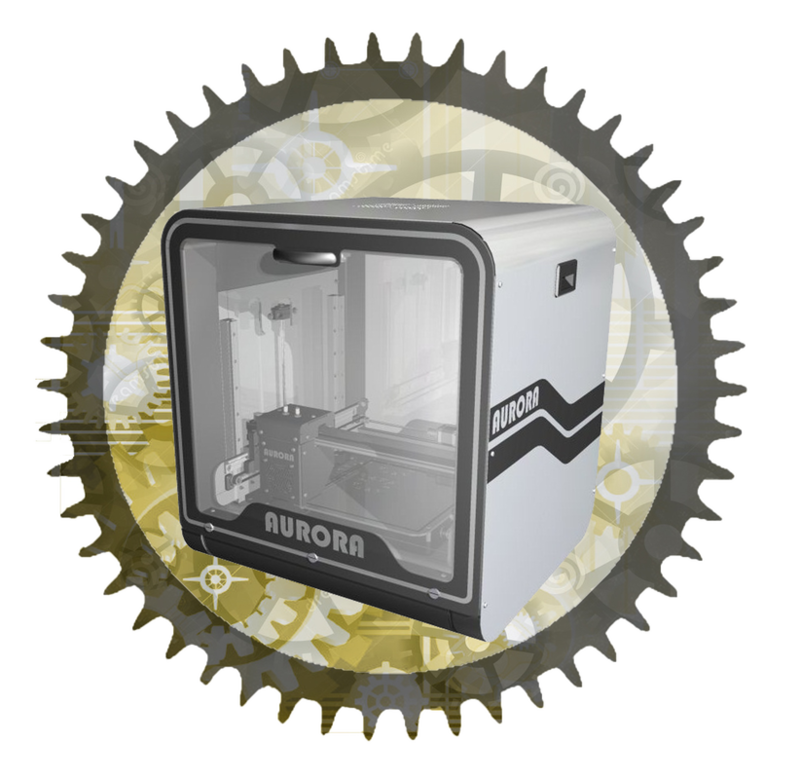 “AURORA” machine is a mono colored 3D printer has been designed using one of the addictive manufacturing techniques regarding the rapid prototyping process. This is technique known as (Fused Deposition Modeling – FDM). First, and like all 3D printer machines, the CAD file of the part which is wanted to be printed to a 3D object is exported with (STL) extension. This extension allows the 3D printer program to view the part as accumulative geometric surfaces rather like the surfaces resulted in (Finite Element Analysis – FEA). Using the 3D printer program, the part can be converted to many tiny slices and then these slices are sent in successive method to the 3D printer machine so the part will be built slice over slice until getting the full 3D built part at the process end, as a result this built part and the modeled part in the CAD program will be alike. This technique, for the purpose of building implement, is count on melting a thermal polymer which pours after positional melting form the actuator head nozzle. The actuator head traces the cross section of the processed slice and builds according to it until the full completely of the slice section. The procedure is repeated many times to complete the part building. This technique uses another thermal polymer as a supporting material to fill all part gaps and to support the built part body is case of balance adjusting during the building process. After the building end, the support material is got rid of and we will get a part or a product built from just the building material. In this printer, the thermal polymer (Acrylonitrile butadiene styrene – ABS) is used, this plastic polymer melts in a Celsius degree between (180 – 220) degrees, and it’s provided in the markets as a filaments coiled around a roll, the used filament diameter is (1.75mm), ABS filaments substance has a color vary. Regarding the supporting material, the used thermal polymer is (Polyvinyl acetate – PVA), this plastic polymer melts in a Celsius degree between (180 – 220) degrees, and it’s provided in the markets as a filaments coiled around a roll, the used filament diameter is (1.75mm) and it’s often found in white color. The important specification for this material is the ability to dissolve into the water. Consequently, after building the part, it’s enough to submerge it into the water and so the supporting material will dissolve into the water and the building material will remain. Both of building and supporting material are provided to the actuator head nozzle by means of a feeding mechanism which consists of a feeder for the purpose of pulling in the plastic filament from the roll and then guiding it into a canal ended with the melting chamber which is in touch with a ceramic heater (40 watt). And thus, the material is melted and poured out through the nozzle which has an orifice with diameter of (0.5mm). The feeding mechanism includes a cooler made from aluminum substance to prevent the heat from transferring toward the top. The number of actuator heads and feeders is two (one actuator heads for building and the other one is for supporting). The heat exchange can be done for the two coolers by a fan in front of the actuator heads. The feeders are run by stepper motors (one for each one). Regarding the Mechanical Design Side, this machine has three axes (X,Y,Z). It depends for moving the actuator head along the (Y) axes, which it represents the machine gantry, on a motion method consists of a stepper motor and high accuracy synchronous pulleys and belt. The motion of the axis (Y) horizontally along the axis (X) is achieved by means of also a stepper motor and high accuracy synchronous pulleys and belt. According to motion of the assembly of (X and Y) axes, it’s the motion along (Z) axis upward or backward using stepper a pair of ballscrews. In all axes, guiding mechanisms are used; they consist of linear guides which are either cylindrical or prismatic. These linear guides don’t need to be lubricated like the traditional ones. The work volume or field for this machine is (30cm×30cm×30cm). (1.5cm) is added to each axis as a margin. Regarding the Dynamic Analysis, the inertia forces and torques were studied, and so the maximum and minimum velocity required to move the actuator head. Consequently, stepper motors were chosen, the number of them is like the number of the axes, these motors rotate (0.9 degree) by each pulse they get, these motors characterized with a high accuracy, the value of rotation will surely taken in consideration to determine the printer accuracy, the load torque for each motor is (4.4 Kg.cm). The building speed according to the (Y) axis is (150 mm/s) in maximum. On the other hand, the motion according the (x) and (Z) axes is done by pulses. The motion accuracy for the (X) and (Y) axes is (30 micron) and the thickness of each layer is (20 micron) as the most maximum accuracy in this 3D printer machine.